I Challenge you… to one of those Christmas letters people send to everyone they know to tell them all about their year – From Michael Gillette. Merry Christmas all! This year has been filled with joy and discovery. I joined the Spirit Collective and had my eyes opened. So I would like to give you the greatest gift of all this Christmas: forgiveness. Last year’s Christmas Cuddles Gathering is all water under the bridge. I certainly don’t blame anyone for not getting into the spirit or going to mum’s without me. I know many of you told me not to join another group but the collective is truly wondrous. They’ve even taught me how to listen again. Hoping your year will be as filled with joy as mine. When you’re stuck in a dark garage for 50 weeks a year you tend to question your existence more than most. Years ago I was a display tree. I was set up for months in a large metropolitan department store. Families looked at me with wonder. I thought I was hot stuff and destined for great things. With a few days before Christmas (my big day) I was sold to a dysfunctional middle class family at half price because of minor damages. In the car on the way home I spotted great leafy statues, I was just a mere imitation of these natural wonders. They were independent and grew where they wanted. I was contained in a plastic bag (the shop had lost my box) and made by a machine. When I got home I was pampered for a few days. But soon enough I was shoved into the dark garage and ignored. I was very hurt and outraged. My existence seemed so pointless. I was just a collection of convenient green plastic bits to display each year in order to fit in with a tradition that is completely misinterpreted and now based on consumerism. But this Christmas as I am being packed away, I’ve realised something. I still have my thoughts. This year I had developed entire philosophies in the dark, and even made friends with the broken toaster next to me. We’d argued about the intricacies of death and life for objects like us. Perhaps it wasn’t such a pointless existence after all. Itchy Pants – from Cinnamon Eacott. Do not iron dry. Elastic will melt into brittle itchy spikes of doom. You will try to surreptitiously scratch yourself just before you go on stage for your speech. And only then will you realise that everyone can see backstage. This may cause colour change (blushing), shrinkage (of brain power on stage) and damages (to job prospects). This is my diary from around year 6-8. 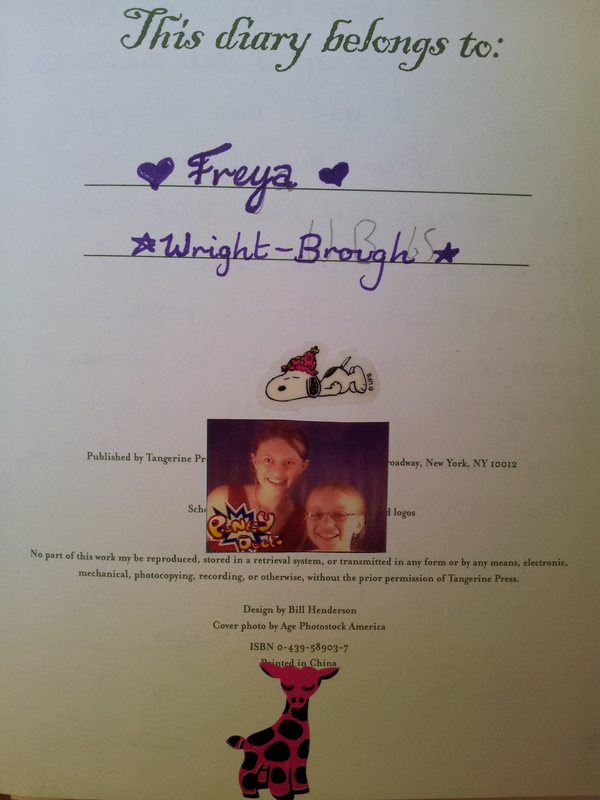 I was challenged the other day to find my entry from the first day of year 8 and write a story on that. So I thought I’d do a Haiku using only direct quotes & phrases. The following is my 13 year old thoughts on moving to high school. Kaitlin Moncrieff challenged me to find lyrics that my friend Georgia May wrote in my school organiser and write a story about that. But (surprisingly) there were none! So I found a note she wrote me in year 10 and developed something around that. 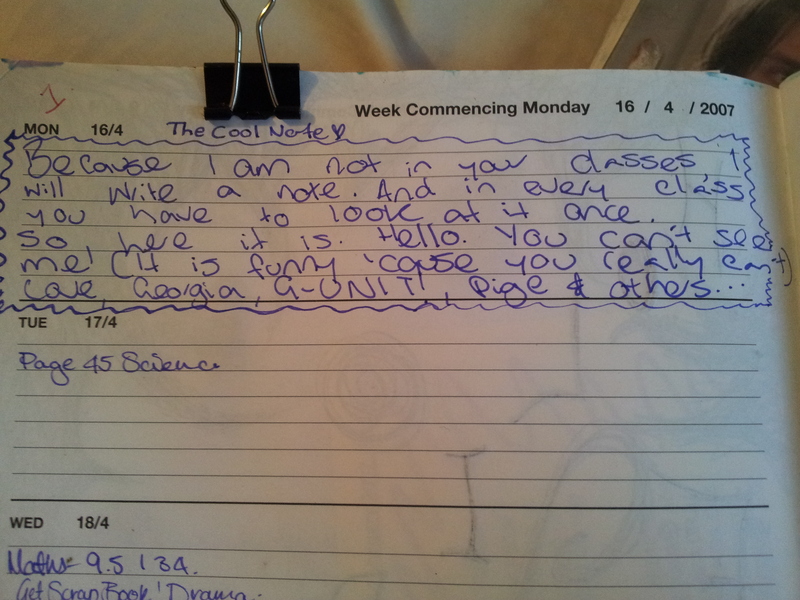 This was the first note to appear in my school organiser. I thought it odd for two reasons: 1. I don’t have any friends and 2. I don’t know any Georgia’s, G-unit’s or Pige’s. The popular girls told me there was a Georgia who died at the school years ago. As the nice little notes continued to materialise over the next few weeks I became convinced I was being haunted.